Every time I walk through the meat isle at my grocery store my heart almost stops at the prices that they charge. Early this summer I decided that I wasn’t going to pay those outrageous prices anymore. 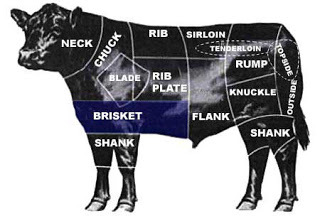 So I decided to do some research on buying a side of beef. I started with butcher shops, the prices were lower but not as low as I would have liked them to be. So I decided to take it a step further, I asked the butchers who they bought their beef from. Some were reluctant to give out their sources while others were extremely open and generous. Did they sell to individuals? Was the price on the hoof or off? What was the average weight of a side of beef? Who did they use to butcher their meat? When did they accept orders? When would it be ready to be butchered? I was lucky enough to find someone who only charged $2.00/lb off the hoof and a butcher who only charged $0.44/lb to cut up the meat. That meant that I was going to get all of my meat for only $2.44/lb, this included: T-bone steaks, ribeye steaks, a variety of roasts as well as ground chuck and other cuts of meat. I immediately placed my order and was told that it would be ready to be butchered by the end of October. This was good for me because it gave me time to save for it and gave me time to buy a bigger freezer. A couple of weeks ago I got a phone call from my farmer friend who told me that the cow had been slaughtered and sent to the butcher. My half weighed 288 pounds off the hoof, which meant I owed him $576.00, thank goodness I was putting money away all summer to pay for it. He told me I needed to call the butcher to let him know how I wanted it packaged. I had no idea how I wanted it packaged, I never did this before. So I called the butcher and they walked me through it all, it was easier then I thought it was going to be. After all of the waiting I was able to pick up our meat today. I brought a couple of coolers with me which I really didn’t need, I live pretty close to the butcher shop and the meat was already packed neatly in boxes. 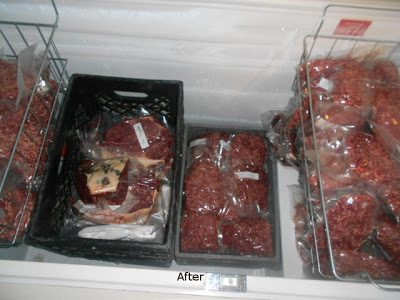 When I got home to fill up my freezer (which I bought off of Craigslist for $25.00) I was completely amazed at how much meat 288 pounds was. We are going to be eating well for a long time. In fact, we are going to eat well tonight because I pulled out some Ribeye’s for dinner. My freezer looks pretty good but it’s missing some pork and poultry, I wonder what kind of deals I can find for those. 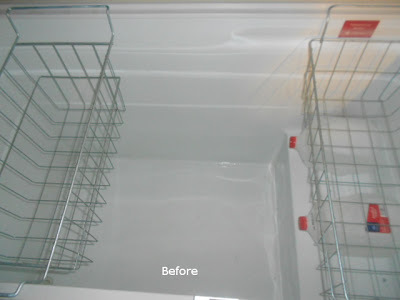 ** Keeping a chest freezer organized is really difficult, so I used milk crates to keep the different cuts of meat separate. You can’t see all of the crates in this picture, but take my word for it there is a lot of meat there.